Yours has the same helical focuser as the Telementor T1, so I would guess it would be a latter style, possibly early 1970's. Bob Trotter from Austrailia would probably have the best guess on that. Contact me privately and I can give you his email address. Carl, I'm not 100% sure but it may be that the focuser on your AS63/840 is a replacement from T1 and not original. Please send inquiry (as P.J. proposed) to Bob Trotter, he made quite a research on early Zeiss scopes (particularly pre-WW2) and let us know the dating result. If the scope was made in early 60ies, then the focuser is later than the scope. Regarding C63/840 vs AS63/840 vs AS80/1200: these scopes are virtually on same level in terms of color correction, practically the difference is too small to be noticed visually, at least I did not. Attached table (posted many times) shows some Zeiss astro objectives with measured amount of secondary spectrum (color aberration). Carl you are absolutely correct - with the same type of objective design the amount of color aberration rises with bigger objective diameter and/or faster F- ratio, attached table clearly shows that. Thanks. I have seen that table as well -- from W. Rohr, I believe. My tube serial number is 36405. Unfortunately, my lens cell lost its serial number through the years. But the prior owner contracted Herr Rohr to personally test this lens. He measured a Strehl of 0.97 and RC (or secondary spectrum) of 1.48. I am curious if my focuser is original or not. Of course, if not there is no easy solution since parts are near impossible to obtain. I ocassionally see Telementor parts. But rarely parts for other scopes. Also, I reside in the USA, and I have to search the former East Europe to find these DDR scopes. Nr36405 dates your scope in May 1960, same batch of 200 scopes as mine. You can be sure that the focuser is later addition to your scope. 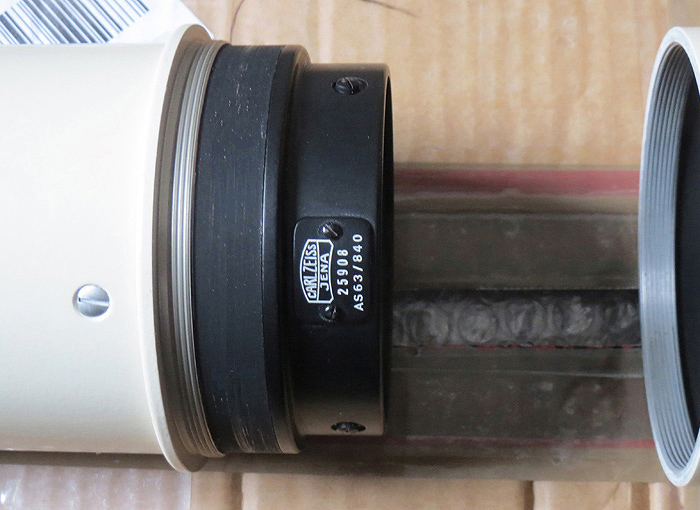 It's probable that the original focuser was damaged and was replaced with new one by one of the previous owners. 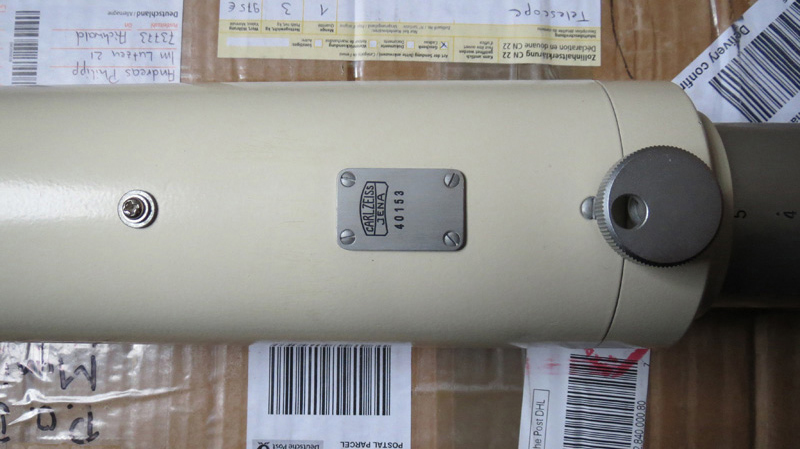 These older type helical focusers are quite rare but not impossible to get. I would not bother myself too much, T1 focuser is worthy and original replacement which could be bought separately at Zeiss when still in production, works the same and is even a bit stronger than older version. 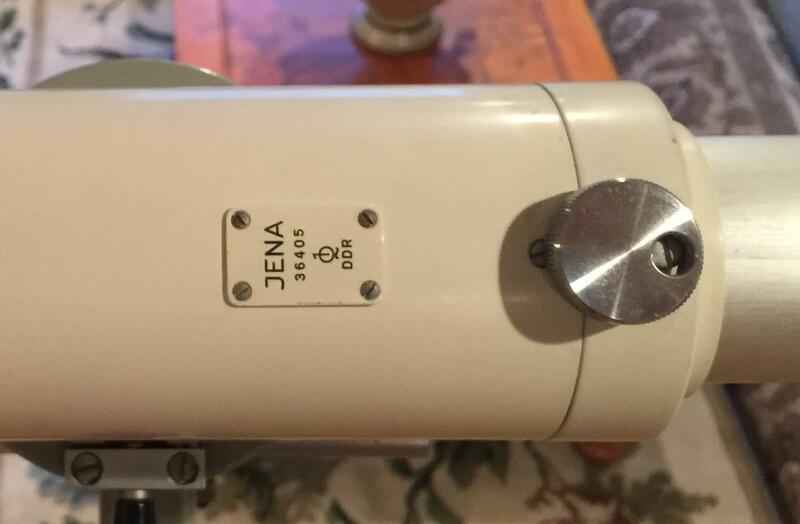 I find it interesting to see two scopes from same batch and only 16 serials apart but obviously yours (JENA) was to be sold in western countries and mine for domestic sell. Thanks for dating my AS. That is very interesting about export vs non-export. I guess it was the Telementor I and II that were never exported? Earlier Zeiss telescopes were allowed to be exported? And, I guess it was the infamous law suit between Zeiss Jena and Zeiss Oberkochen (sp?) that dictated how exported Zeiss telescopes could be labelled? I would love to hear a concise history of that period of Zeiss. It was never really clear to me. And, thanks for the comparison between the Telementor I helical and AS helical. Is there any way to determine roughly the age of the lens cell without the serial number? I wonder if my lens cell is original or not. Finally, does any one have a Zeiss catalog that has this version of the AS in it? 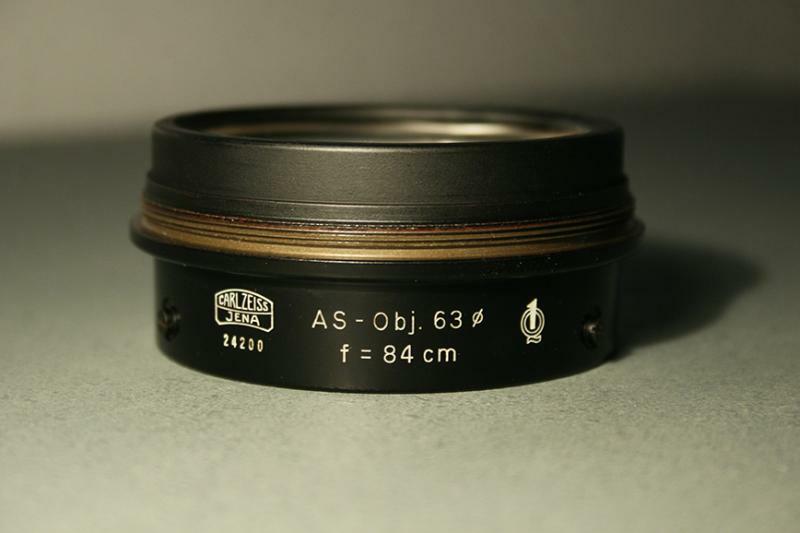 I have about 15 different Zeiss telescope catalogs, but none that have the later version of the AS63. Oh -- last night was first light. At 84x, no discernible spurious color on the moon or Jupiter. None at all. No image break down either -- obvious that this little Zeiss can handle higher powers. But, an O-10 is as high as I have at the moment. Anyway, images were very sharp. Didn't do a star test -- I'll have to do that later. And, a critical side-by-side with my Telementors. Although, from memory, I'd say that the AS is a bit higher contrast and less color. Here is the serial number on my 1963 model. 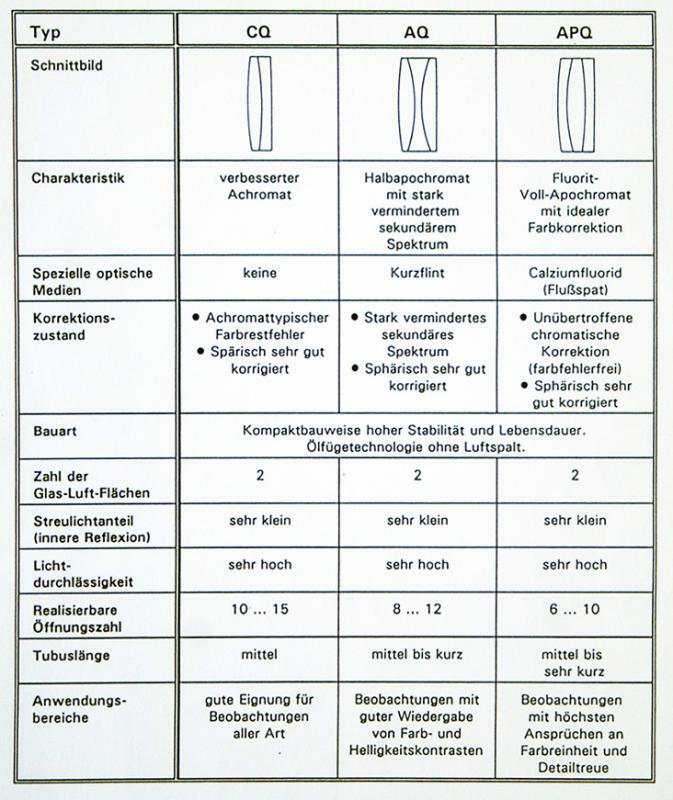 I would agree with Janez - that if your scope is a 1960 version, then the focuser must have been changed at some time. Also, your catalogs would have to be from 1950's to 1970's to have an AS63 listed. I have a 1952, 1959, 1968, 1969, 1970, 1975, . . . Although some AS63s are pictured, none are quite like these. For instance, the draw tube lock knob (shown in the last three pictures in this thread) appears on a collar at the end of the OTA, not on the actual OTA as above. Subtle differences, but interesting. My gap in catalogs might explain this. I don't have any catalogs from the early 60s. That is very interesting about export vs non-export. I guess it was the Telementor I and II that were never exported? Earlier Zeiss telescopes were allowed to be exported? All serial produced Zeiss telescopes, throughout its entire history, were exported, although perhaps not to all parts of the world. The Telementors, in all versions, were certainly exported, as I've seen ads in English from the US. 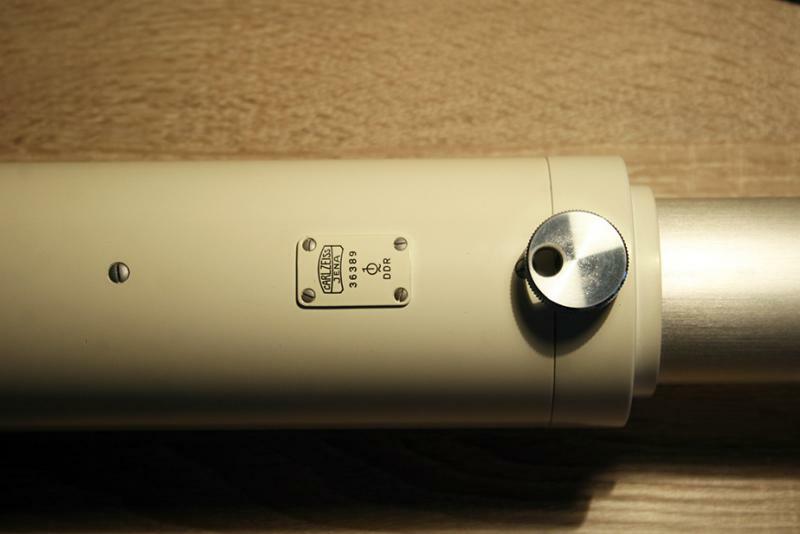 the objective cell from 1960 should have its numbers and Zeiss logo engraved, aluminum sheet decals were used later, surely in 80'ies. 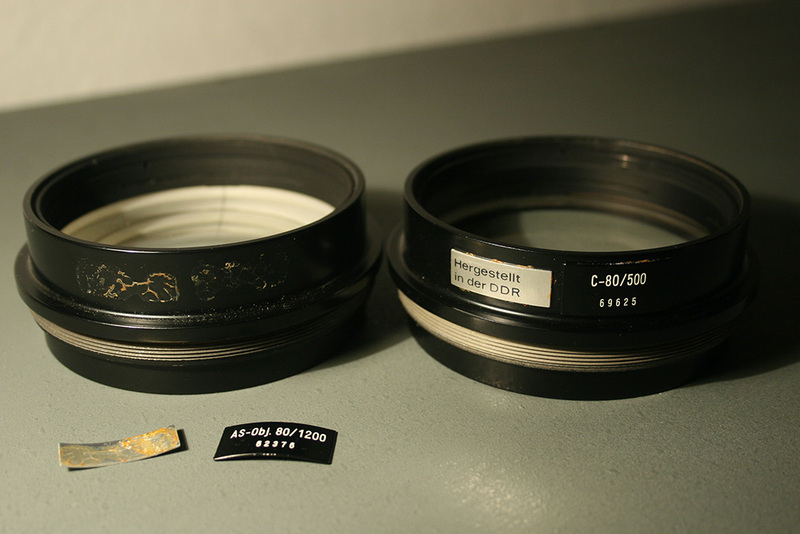 Also astro objective lenses from 1960 were not AR coated or very rarely with almost unnoticeable yellowish AR coating. I found out that star testing Zeiss objectives is pretty boring, no matter what C or AS objective test results are always the same: textbook image of diffraction with some slight violet halo around perfect rings. Edited by Orogeneza, 14 May 2016 - 03:54 PM. I think color correction varies with the specific example and with people's eyes. In my examples of the Telementor and the AS 63/840, I noticed a substantial difference in false color. 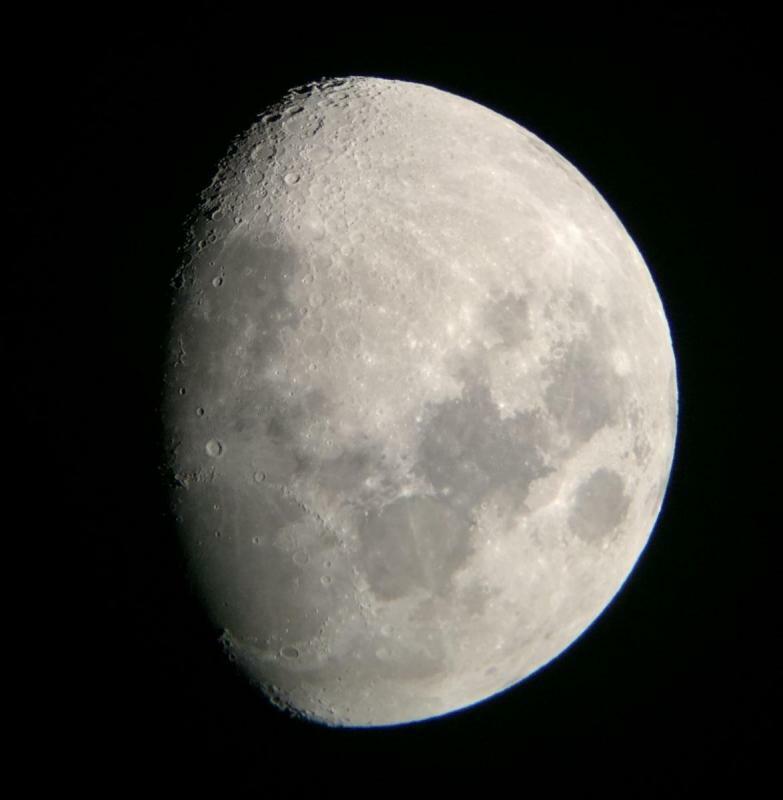 Both scopes were very sharp, and the color wasn't bothersome in either, but it was barely visible in focus in the AS. I agree that the AS 63/840 and AS 80/1200 have about the same color correction, and this is similar to that seen in the one-off AS 100/2000. I was also surprised at the low color of the AS 100/1000 based on the predicted number of the chart. Daytime observations bring out color differences between the models more easily. Here is a pic of my scope's objective cell. Is this the "engraved logo" or the "aluminum sheet decals" you are referring to? I thought the color correction in my AS100/1000 was very good, but when I purchased a Showa SD100/1000 and compared the two alongside each other, I found the color correction improvement in the apo was noticeable. In James Baker's article in "Applied Optics" on "Planetary Telescopes" he stated: "The AS objectives are doublets with flint leading and are thought of as "half-apochromats" or semiapochromats". So not considered an apo, but still very good. I completely agree Derek and I have no doubt that thorough test would show differences in color correction between C63/840 and AS63/840 objectives. There is one advantage of small C type objectives (C63/840 and C50/540) against AS and E type objectives: the lens could be cemented. With "aluminum sheet decals" I was referring to printed and engraved decals glued to lens cells in 80ies. These usually fall off and get lost with time so I suspected Carl has one of these. - see attached picture. Edited by Orogeneza, 14 May 2016 - 03:53 PM. Thanks Thomas. For some reason, I thought at least the Telementor was not exported. I guess, then, that exported Zeiss had different (or no) Zeiss logo? Earlier Telementors perhaps no logos? Both my Telementors have no exterior Zeiss logos. The Telementor 2 has Carl Zeiss on the lens cell. My T1 has no logo on the cell. 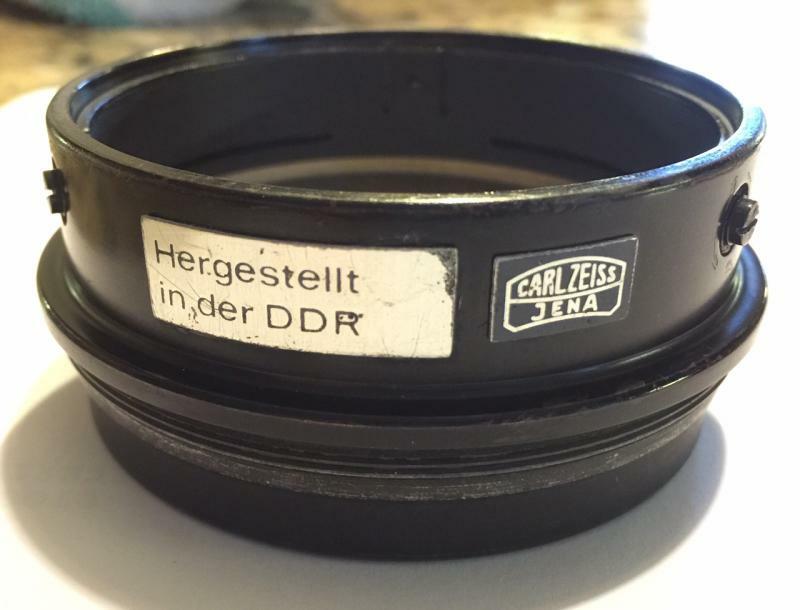 Janez, my AS has a Carl Zeiss metal decal, and a Hergestelldt in de DDR decal. No engravings unless under the decals. I am reluctant to remove the decals to find out. I am not sure if cementing the cells is an advantage. It reduces the degrees of freedom in the lens design. Plus, I guess they can delaminate. That would be a fun repair! Did Zeiss make AS63 cells in the 80s? Edited by idahoman, 14 May 2016 - 06:28 PM. Here is my lens cell. No engravings that I can discern. There should be no engravings under decals (actually the missing decall with Nr. had its text engraved). Seems that your objective lens was upgraded with latter AR coated version. Gluing the decals is the only difference between older and newer lens cells - the quality remained the same. I did some quite rigorous tests between one older 1Q AS80/1200 and one newer example - as I said in my previous post: boring repetitive result. Most probably the production of AS63/840 lenses ended with introduction of T1, but I'm positive that the lens could be bought at Zeiss afterwards for some years. I understand air-spaced designs of doublet lenses are way to go for modern designers, but at F/13.33 color aberrations are already well under control and there is big advantage in eliminating two air-to-glass surfaces. Well Zeiss did that historically and also their new CQ and AQ lenses (never in production) were not air-spaced designs but oil-spaced. I surely miss my Telementor scopes, they were victims of getting funds for bigger Zeiss scopes, I'm almost sure I will buy another one in the future. 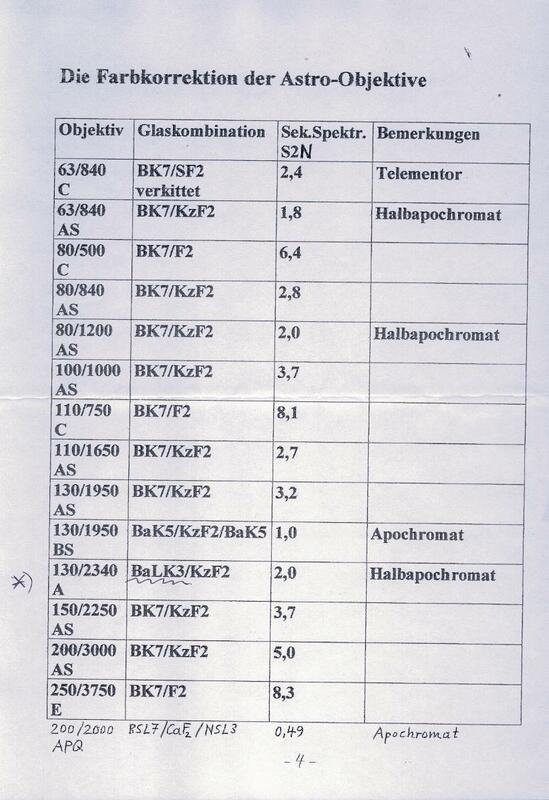 Janez, you are a wealth of info about these old Zeiss scopes. First, "their new CQ and AQ lenses (never in production) were not air-spaced designs but oil-spaced" -- I assume you mean the "APQ" but I am not sure what you mean by "CQ"? I am not familiar with that lens model. Of course, the APQ was one of the finest designs ever produced, and I anticipate that I will never own one! Oh well. Also, you theory about my scope is that a newer lens cell was installed onto an older tube. And, the newer lens cell as AR coatings. Interesting. But, the weight of the lens cell seems to indicate brass. Seems heavy for aluminum. But, this is the only AS cell I have ever held. 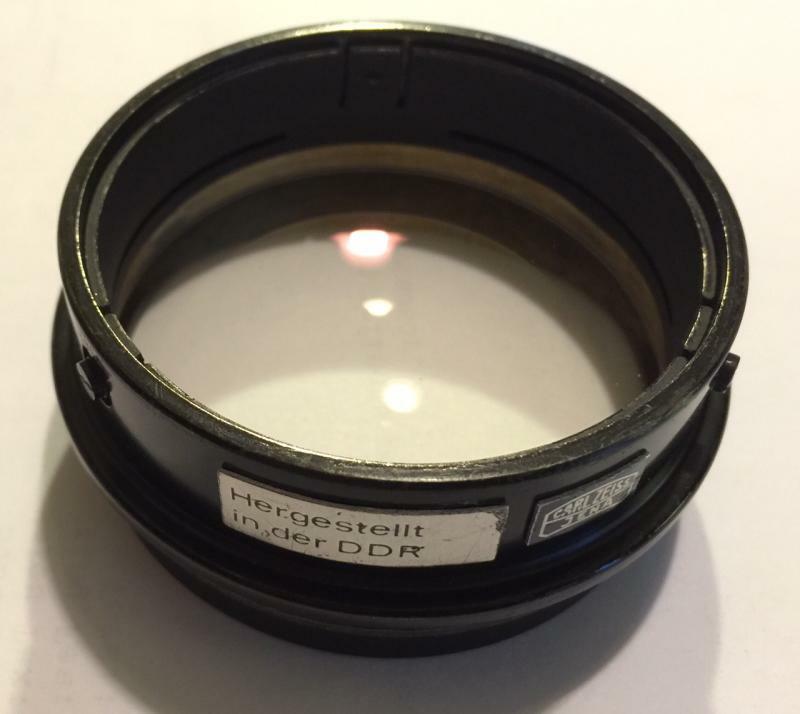 Have you ever heard any stories about counterfeit Zeiss lens cells? Neil English in his book talks about this. Seems like a lot of work to counterfeit one. Zeiss AS 63/840mm takes on the moon. IPhone 6 photo courtesy my son. I have a dent in my draw tube where, with the draw tube pushed max into the OTA, someone tightened the locking screw way too much. I couldn't care less either. I wonder if the counterfeit Zeiss stuff is an urban myth. Lot of work for a relatively small amount of money. Also, the lens / lens cell designs from Zeiss ting to be very unique. First, I do not find myself very much knowable about Zeiss scopes but in process of collecting Zeiss stuff I met few really educated guys with wealth of information, much of it from original sources at Zeiss. Not to mention some really nice guys I fancy as friends I met across the globe during this period. 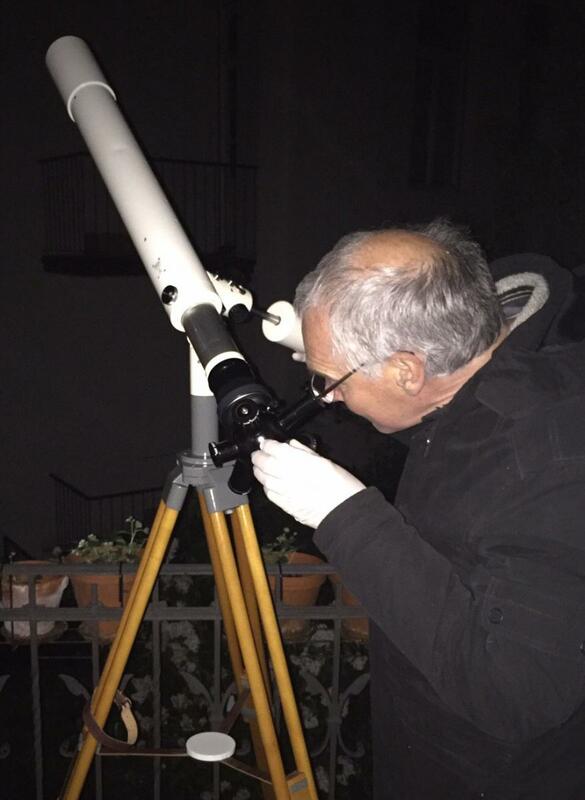 My "theory" about your scope: someone reinstated excellent AS63/840 tube with new lens and new focuser, that's all. Your lens cell is made of special steel alloy (nickel-iron?) and I'm sure it is 100% original. I never saw any counterfeit Zeiss lens cells, but there were/are examples of astro optics selling and claimed to be made by Zeiss but are not. I meant as I wrote, debate of CQ and AQ lenses is purely academic one as there are no known examples. See attached table from September 1992.